I’d intended to shake my penchant for procrastination after freshman year of college. But here I was, my first big art history due date of sophomore year looming frighteningly on my calendar, and all I could do was lie under a blanket on the couch, binge-watching bad TV, and bemoaning my mental paralysis to my roommate Kate. Art classes were my favorite, and yet, I just couldn’t get inspired when it came to writing papers or showing up on time for class. 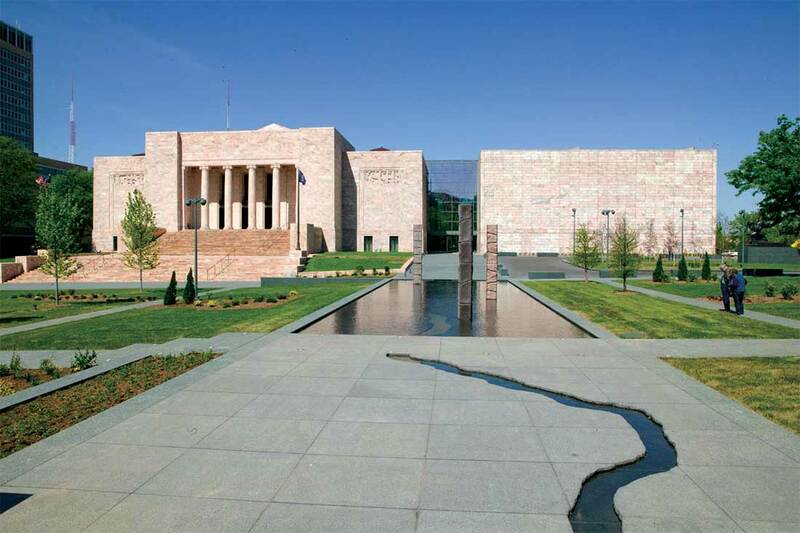 Luckily, Kate’s from Omaha with encyclopedic knowledge of the city’s culture, and she suggested a quick weekend trip to visit Joslyn Art Museum. Kate’s also a classic Type A personality. I could sense her satisfaction when she stood up during my deadline whining and yanked my blanket off, sending the remote flying across the room. Kate called a friend to arrange a place for us to stay and we made the short drive to Omaha. We arrived to find a lovely green space and sculpture garden outside to Joslyn’s east, between the mammoth marble museum and Central High School—another stately building that Kate said was once the capital of the Nebraska Territory. 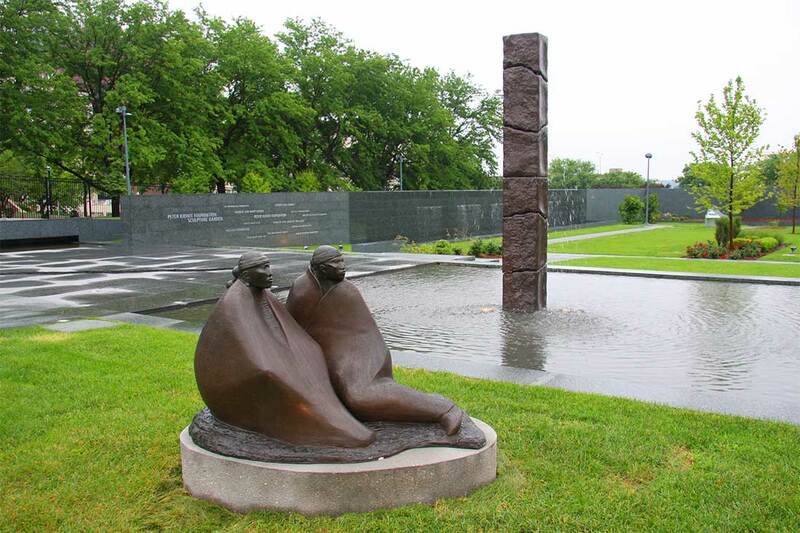 The sculpture garden sprawled across an acre-plus, creating a record of faces and places that signified the region. 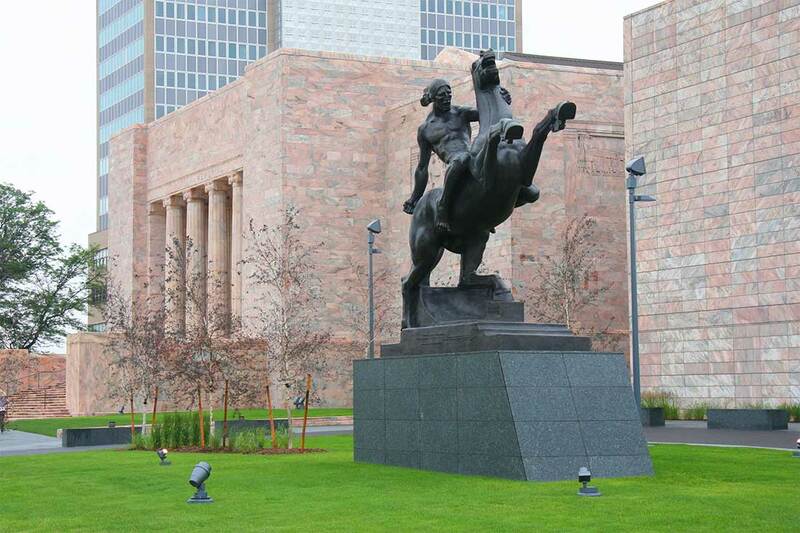 A proud Sioux warrior sat atop a rearing horse that looked like it might just take flight. A saffron-hued hypnotist’s swirl unfurled from the face of one of Japanese-born, Omaha-based artist Jun Kaneko’s iconic, large-scale ceramic heads. A bronze, cartoonish pioneer smoked a pipe while steering a covered wagon. I lingered by the reflecting pool that ran through the garden’s center. A top layer of granite was cut out, revealing waters underneath that created a representation of the snaking Missouri River. My image beamed up from the water’s mirror-like surface. I took a moment to reflect, until my face was displaced by a toddler splashing in the shallow pool. Upstairs against the eastern glass wall and ceiling was the colossally colorful Chihuly: Inside and Out sculpture by glass-master Dale Chihuly. 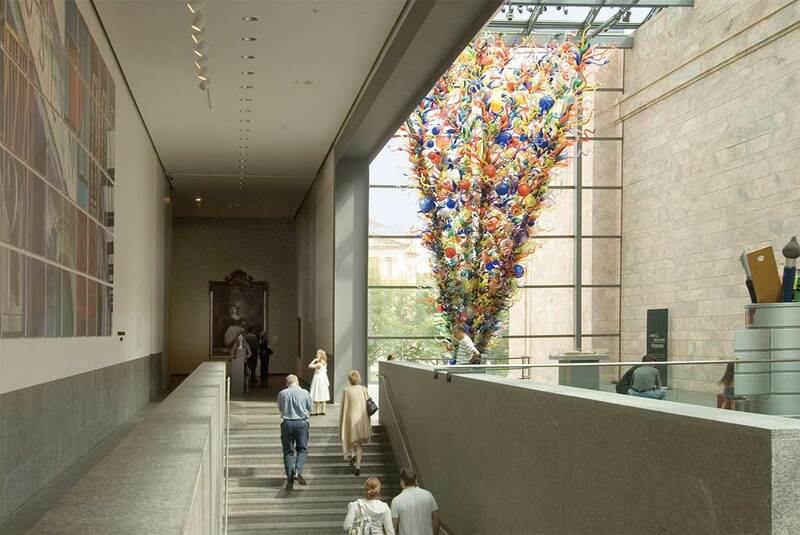 More than 2,000 pieces of multicolored glass stretched 30 feet high in a sprawling V-shape that trumpeted up toward the heavens. The smooth orbs, twisting tendrils, textured gourd and flower-shaped pieces looked like an explosive exodus from a Pandora’s box filled with only light and love. The sun danced through each element, coloring its own evolving kaleidoscope and casting shadows on the marble wall. After gawking for ages at the glass sculpture, Kate and I explored several galleries—surveying cool, angular, contemporary art and curious, offbeat installations, realist portraits, devotional Christian paintings, Greek pottery, an alabaster Ganesha and bronze Bodhisattva, twisted abstract works, fertile regionalist landscapes and ethereal impressionist pieces. Kate often pointed out her favorite pieces as we strolled by, which gave me some extra food for thought. Spanish-inspired paintings of “virgins and saints,” as the sign said, reminded me of my Tarot cards, with their rich colors, symbolic elements and evocative scenes. Our Lady of Sorrows showed Mary in mourning, beset by cherubs, with seven swords piercing her heart. At her feet were a black rooster, a crown of thorns and a hand releasing a pair of tumbling dice. As I made a mental note to compare this later to my Seven of Swords card, I noticed the painting was credited to an unknown Bolivian artist. I yearned to know more about the anonymous maker. Kate and I headed into the Scott Gallery, where we chatted with a docent about some of the art. Kate and I asked James some more questions, admiring Dutch master Rembrandt van Rijn’s Portrait of Dirck van Os. The eponymous subject was an older fella dressed in black with a gray beard and mane. He held a tall cane in his left hand, although he looked too spry to need it. The dark, shadowy background made the elusive expression on his pale face pop. Was the man uneasy or elated? He looked like he might be about to either announce an approaching danger, throw down his cane and run or tell a sly joke then burst out with a hearty, unrestrained belly laugh. I pulled out my phone to snap a quick pic (without flash!) and the camera’s face detection put a small square around the man’s head, in a strange combination of old and new artifacts. I was properly fascinated; the mysterious, storied Rembrandt was the perfect topic for my paper. Kate wanted to stop by the fountain before we left. As we entered the court, I was taken by the aqua-colored, Art Deco fountain, accented with dark blue and orange tiles and filled with shimmering water and glinting coins. I held my penny and my breath, made my longing known to the universe and tossed the coin into the fountain. It hit the surface hard like a belly flop, then slowly sank to rest on vibrant tiles. I can’t reveal my wish, but I can say I was deeply inspired by the symphony of creators, colors, shapes and stories I found at Joslyn—from Native Americans to pioneers, ancient to contemporary, lives spanning various centuries, religions and realities. Witnessing so many different voices represented, I felt empowered to stop procrastinating once and for all, and to add my voice to the timeless, global choir of creativity.